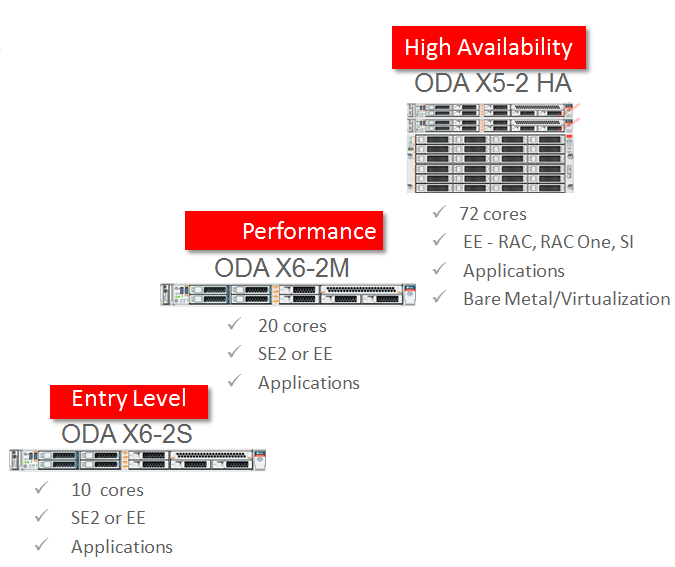 Oracle introduced the ODA X6-2S and ODA X6-2M. And no, they are not the successor of the quite popular ODA X5-2, which we installed and configured quite a number of times lately. These 2 new machines are the in-between ODA’s, entry level machines for small business. Single node with flash storage, also suitable for Oracle Database Standard Edition 2. But…. commodity hardware is also single node and suitable for all Oracle database Editions, so what’s the gap Oracle is filling between commodity hardware and an ODA X5-2? This post will handle the characteristics of the new ODA X6-2 machines and the differences between commodity hardware and the range of Oracle Database Appliances. In the past it was not always easy to conduct a solid business case for the ODA X5-2. Although a wonderful machine with high availability features and agile licensing, the price and the fact that only the Enterprise Edition of the database was allowed on the bare metal version weren’t always in favor of the business cases for an ODA. So what kind of machines Oracle introduced this time? 2 x 3.2 TB SSD (NVMe – Non-Volatile Memory Express) Storage, expandable with 2 x 3.2 TB. So… what’s the number 2 doing in ODA X6-2? This is not a 2-node machine, but it’s related to a 2-socket node! 2 x 3.2 TB SSD (NVMe) Storage, expandable with 2 x 3.2 TB. New command line interface for operations : ODACLI. Commands like create-database, create-dbhome, create-network. Seemed not complete by the way at the time of writing. New command line interface for maintenance: ODAADMCLI. In this version the commands are quite restricted to show and locate commands: e.g. show disk, show diskgroup, show server. A web interface for deploying the Database Appliance. Faster storage by using NVMe. This is a communications interface/protocol developed specially for SSDs, bypassing the SAS controller. Managing more dan 1 ODA through the webconsole. More closely integration with backup cloud. IO-performance characteristics of these new SSD-storage – slide and numbers from Oracle – are mentioned below. I won’t dare to compare these figures with the existing ODA X5-2. The best way to compare these ODA’s is to run the same test as in this document, time will tell. 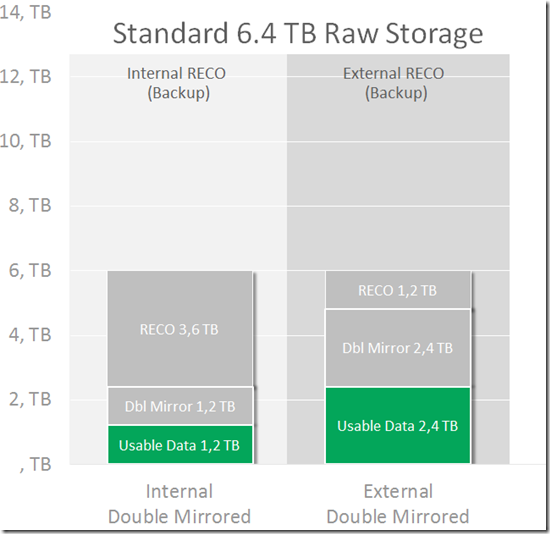 Storage (also see below) 2 x 3.2 TB +, only normal redundancy possible. A quick note about the storage. 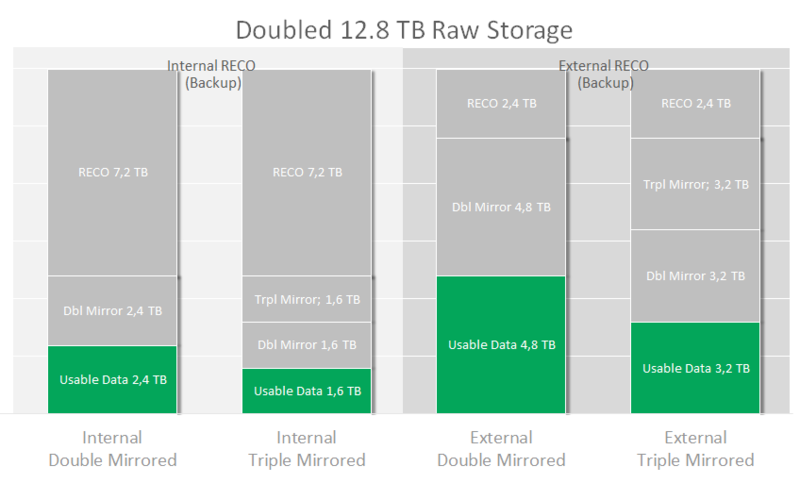 There’s default 3.2TB present (extendable with another 3.2TB), and there are a few ways to split this, depending if you are backing up externally or internally. The out-of-the-box raw storage can only be configured with normal redundancy. When doubling this storage the following split is possible. And here you’ve got the choice between double or triple mirroring. – Capacity on Demand. For databases you don’t have to use Oracle VM to limit the use of cores for license reasons. Made it easier with a new command: # configure-core-count <cpu_number> . Nice principle of Keep It Simple. – Standardized deployment of databases by using the included deployment software and templates, accessible by a web-based interface. – As of all ODA’s : integrated / automated patch management, and of course ASR, the Auto Service Request functionality.